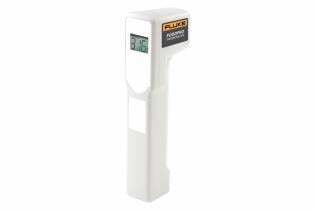 The Fluke FoodPro Plus combines an infrared non-contact thermometer for surface scans with a probe thermometer for internal temperature readings. An integrated countdown timer with alarm monitors line checks as well as cooking and cooling intervals. Fluke brings its test and measurement equipment expertise to the foodservice industry with contact and non-contact temperature measurement solutions. The Fluke FoodPro Plus thermometerprovides a complete temperature measurement and monitoring solution for foodservice professionals. It includes one useful temperature inspection tool, which is designed to enable foodservice professionals to quickly and accurately measure food product temperatures and to help detect potential food safety problems. 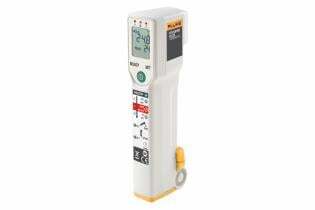 The Fluke FoodPro Plus thermometer is hand-washable and features unique HACCP check lights, which immediately indicate safe or potentially unsafe holding temperatures with either green or red lights. Receiving: Use FoodPro Plus thermometer to quickly verify proper temperatures of food products at the point of delivery as recommended by your HACCP program. At calibration geometry of 279 mm with a 140 mm diameter, 0.97 emissivity blackbody.